Four men have been arrested and are being questioned under the Terrorism Act in a series of armed raids by police officers across London. The men, who were arrested yesterday evening in Whitechapel, Peckham and Bayswater and currently being detained on suspicion of the commission, preparation or instigation of acts of terrorism. Searches at another six addresses across the capital are currently continuing. Eyewitnesses to the arrests have said that there appeared to be a high level of planning and co-ordination from the police, suggesting the alleged terrorist plot had been monitored for some time. Whitehall officials confirmed today that the plot was ‘potentially very serious’. 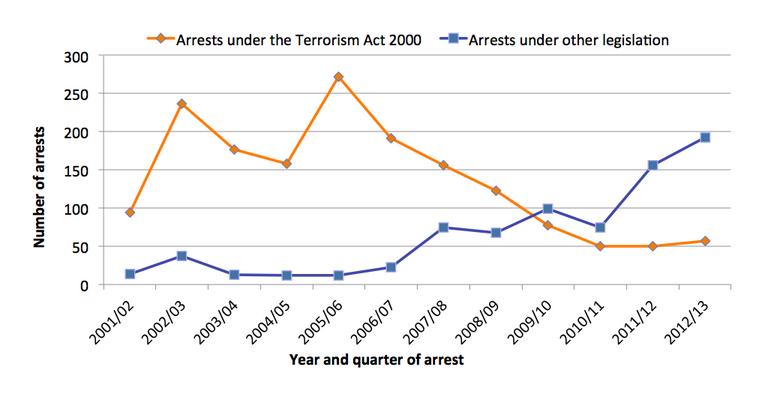 Of the 249 people arrested for terrorism-related offences in 2012/13 (not including the arrests made yesterday), 105 (42%) were charged, 105 (42%) were released without charge and 39 (16%) had alternative action taken against them. This compares to 37% charged, 54% released and 9% with alternative action taken since September 11th 2001.